Big Hero 6’s considerable graces as an animated film—its fantastical layouts and bouncy sense of figure and motion—are offset by its deficiencies as a second-rate superhero flick. The movie is imaginative in its handling of Baymax—its Miyazakian balloon-man, often seen looming over a runty teenage boy’s shoulder or struggling to squeeze past furniture—and its Japanese-American near-future setting, and derivative in most other respects. Ultimately, it sacrifices something unique and poignant in favor of the kind of loud, instantly forgettable team-effort showdown familiar from countless live-action Marvel movies of the past decade. That’s a shame, because Baymax—an inflatable medical robot designed by a college student, and left in the care of his whiz-kid brother—is such a terrific image of both otherworldliness and gentleness, a figure without angles, barely able to get through a doorway, guided by pure, programmed selflessness. In the age of computer animation, which is increasingly concerned with applying realistic textures and physics to non-realistic figures, the smooth white Baymax seems like a throwback to the playfulness of hand-drawn animation, his shape and movements continually distorted. 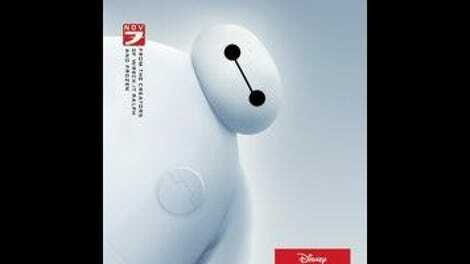 Voiced by Scott Adsit with a mixture of naiveté and deep-seated caring, Baymax acts like a visitor from another, more generous world—the world of technological promise. 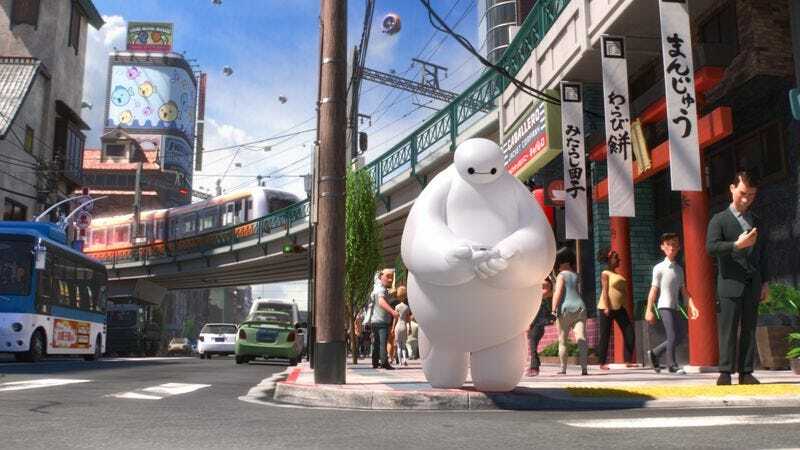 Very, very loosely adapted from an obscure Marvel title (let’s just say the original Baymax is anything but cuddly), Big Hero 6 is set in San Fransokyo, an imaginary hybrid city with San Francisco’s geography and Tokyo’s architecture, where Blade Runner-style airships crisscross the sky and remote-controlled robots duke it out in back-alley betting parlors. Here, 14-year-old orphan Hiro (voiced by Ryan Potter) enlists Baymax in his search for a kabuki-masked villain who is wreaking havoc using an army of nanobots based on one of Hiro’s designs. There is something elegant in the idea of pitting Baymax, bumbling symbol of altruistic science, against a dangerous and misused technology, and there’s more than a hint of poignancy in the fact that Baymax is aiding Hiro because he is his “patient,” believing that spending time with friends (i.e. assembling a superhero team) and going on adventures will help the boy deal with unresolved grief. But once the team—laser-wielding neat-freak Wasabi (Damon Wayans Jr.), high-tech chemist Honey Lemon (Genesis Rodriguez), disc-throwing speed-skater Go Go (Jamie Chung), and kaiju-obsessed freegan stoner Fred (T.J. Miller)—comes together, and Hiro outfits Baymax with a rocket-powered exoskeleton, the movie loses sight of all the things that made it special. When Hiro and Baymax—his body deflated and his speech slurred because of a low battery—sneak around the house where Hiro lives with his aunt, Cass (Maya Rudolph), they register as characters; blasting away at the bad guy while dressed in brightly colored, reflective armor, they seem like little more than a couple of generic costumes doing battle with a hackneyed trope.